Whether you are starting up or have an established online business, the right team structure can make all the difference. You started an online business to live your best life and the right team support can make that a reality. 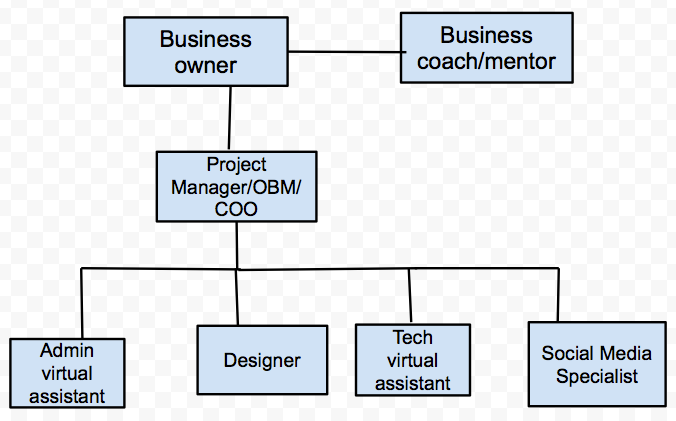 But how should you structure the support in your business as it grows beyond what you can do on your own? What if you are just starting out and you’re not sure what support you should have? Depending on the phase your business is in, you may structure your support in one of three ways. Phase 3: When you’ve reached this phase, the business is growing faster than you can keep up with. You have several projects and revenue streams in your business and it has grown beyond what you can manage on an ongoing basis. You have several team members that are all working in different capacities on various projects, and a big part of your job has become managing and keeping up with day-to-day tasks. In order for the business to keep growing, you need to structure your team in a way that frees you out of the details. Every business is a unique snowflake and yours could look different depending on your needs and desires. Take some time this week to think about where your business is at and how you want to structure your team. Maybe you like staying in the details and being in the management role. Maybe you want your business to stay tight and lean with you as the primary player. Maybe you want to create a business that scales and you want to get out of the day-to-day management. How you structure your team support is up to you. The most important thing is that your team is structured to support you to be the best business owner you can be! Want more of this goodness? Sign up for free updates directly in your inbox! It just goes to show that no matter what level you are, you can start building your team. Thanks Michael! Yes, no matter what stage a business is in, an entrepreneur always needs help! Look forward to staying in touch. Sign up for updates about creative projects and my life musings. Silicon Valley Fashion Week?! Uh huh.